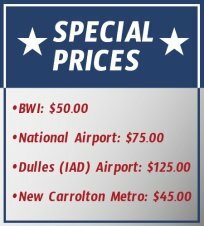 Annapolis Taxi Service offers efficient, safe and dependable taxi service to meet the transportation needs of residents, visitors and our corporate clients. Our extensive service area includes Annapolis, Edgewater, Mayo, Cape ST Claire, Arnold, SevernaPark, Crownsville, parts of Crofton and all its surrounding areas. Annapolis Taxi Service drivers are the most professional independent business persons in the industry. Our drivers are licensed and required to successfully complete a formal training program, which includes training in defensive driving and safety. In addition, they undergo a background checks and drug testing to ensure your safety and give our customers the highest level of confidence in our taxi service.We offer a full range of taxi services. Call us for dependable service for airport shuttle, sightseeing tours, or for transportation to medical visits, social visits or shopping. Our nearest driver will pick you up. We also offer corporate accounts, which provide businesses with a convenient method. Annapolis Taxi Service drivers are the most professional independent business persons in the industry. Our drivers are licensed and required to successfully complete a formal training program, which includes training in defensive driving and safety.